Arthritis is a very broad category of disorders defined by joint pain, stiffness, and swelling. There are many potential causes of arthritis, ranging from rare infections to general wear and tear. Being informed about the causes of arthritis is important because it can help your senior loved one seek appropriate treatment methods. The majority of cases of senior arthritis are caused by the following factors. Mechanical stress is the biggest cause of arthritis in seniors, and it results in a type of arthritis called osteoarthritis. Osteoarthritis develops when the bone and protective cartilage in a joint gradually breaks down over time, which is usually due to wear and tear from repeated motion. 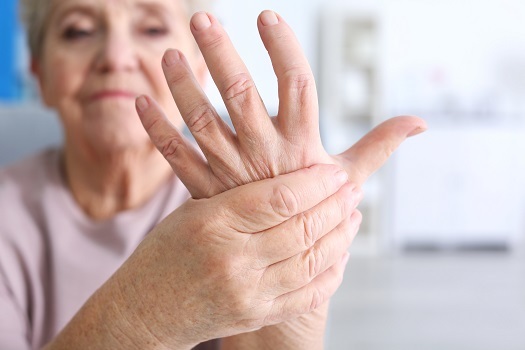 People with this type of arthritis often get it in weight bearing joints like the knees, hips, and spine, but it can also occur in regularly used spots like the tips of the fingers and the neck. Living with arthritis can make it challenging for seniors to accomplish certain daily tasks. Aging adults who require assistance with the tasks of daily living can benefit from reliable home care. Winnipeg, MB, families trust Home Care Assistance to provide the high-quality care their elderly loved ones need and deserve. Our caregivers are trained to help seniors prevent and manage serious illnesses and encourage them to make healthier decisions as they age. In seniors with rheumatoid arthritis, an overactive immune system mistakenly targets the joints. Unlike osteoarthritis, this cause of arthritis is more likely to result in swollen, reddened joints. Rheumatoid arthritis can gradually cause loss of function in the joints, but treatment to reduce the inflammation and immune response can slow the progression of the disorder. Gout occurs when too much uric acid builds up in the blood and crystallizes in the joints. Gout is a fairly complicated cause of arthritis, and it can occur due to genes, diabetes, or an imbalanced diet. The most common place people get gout is at the base of the big toe, but it can also affect other joints in the hands, feet, and legs. Arthritis isn’t preventable in many cases. Some people are born with genes that make their cartilage degrade over time, cause their immune system to attack their joints, or keep their body from getting rid of excess uric acid. There are various genetic causes that can result in different types of arthritis. Occasionally an injury is bad enough to cause osteoarthritis to develop. In seniors, this style of arthritis often appears after a fall that causes a sudden blow to a knee, hip, shoulder, or ankle. Injury-related arthritis is particularly likely to result in joint instability or deformities that make daily activity difficult to manage. Every senior has different needs when aging in place. Some simply need occasional assistance with household chores, while others may be managing a serious illness and require more extensive live-in care. Winnipeg, Manitoba, seniors can count on Home Care Assistance to provide the in-home care they need and deserve. Septic arthritis is a type of joint damage caused by an infection within the joint of the bone. Having diabetes, being over the age of 80, or recently having joint surgery are some of the major risk factors for septic arthritis, so it’s no surprise it occurs most commonly among the senior population. Prompt treatment of the infection can ensure the affected senior retains as much joint function as possible. Arthritis is just one of the many conditions seniors are susceptible to as they age. Living alone at home in the golden years can present a few unique challenges. Trust Winnipeg in-home care professionals to help your senior loved one maintain a higher quality of life while he or she manages an illness and performs the daily tasks of living. Call Home Care Assistance (204) 489 6000 to schedule a complimentary in-home consultation and find out how we can help your loved one maintain a high quality of life in the golden years.